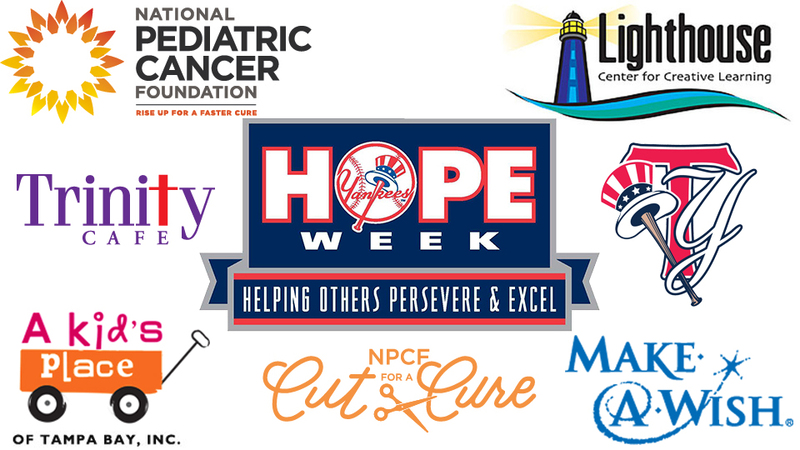 TAMPA, Fla. - The Tampa Yankees will participate in HOPE Week (Helping Others Persevere & Excel) from Tuesday, August 8th through Saturday, August 12th, 2017. Tuesday, August 8th - The Tampa Yankees will attend the Lighthouse Center for Creative Learning (a school for children with autism) and hang out with kids, including playing catch and reading, from 10:00 a.m. to 12:00 p.m. Students and families from the center are invited to attend the 7:00 p.m. game vs. the Clearwater Threshers and take the field with the T-Yanks as part of the Baseball Buddies Program. The Lighthouse Center for Creative Learning has been "helping students find their way for more than 15 years!" For more information, visit www.come2lighthouse.com. Wednesday, August 9th - The Tampa Yankees will visit A Kid's Place of Tampa Bay and hang out with the kids, playing games from 10:00 a.m. to 12:00 p.m.
"A Kid's Place provides residential services to children from birth to age 18, who have been removed from their homes due to abuse, neglect or abandonment and to provide a variety of services which meet the social, educational, medical, and psychological needs of the child." - www.akidsplacetb.org. Thursday, August 10th - The Tampa Yankees plan to visit Trinity Café and assist in serving lunch from 11:00 a.m. to 1:00 p.m. Trinity Café opened in 2001. Its mission is "to restore a sense of dignity to the homeless & hungry while serving a nutritious meal. We faithfully treat all of God's children with dignity, compassion, love, and respect." - www.trinitycafe.org. Friday, August 11th - The Make-A-Wish Foundation will attend the 7:00 p.m. game between the Tampa Yankees and St. Lucie Mets and accept donations. The foundation will also participate in the Baseball Buddies Program, giving kids the opportunity to go on the field and meet players. A representative from the Make-A-Wish Foundation will throw out the ceremonial first pitch. More information about the Make-A-Wish Foundation can be found at www.wish.org. Saturday, August 12th - HOPE Week will conclude with the National Pediatric Cancer Foundation's "Cut for a Cure" campaign as well as "Blue's Back to School Party." Tampa Yankees players, staff and fans will be able to help pediatric cancer research by having their heads shaved, beginning at 5:00 p.m. Pediatric cancer survivors will be on hand to shave the heads of participants and will then get to participate in the Baseball Buddies program prior to the 6:30 p.m. game vs. the St. Lucie Mets. Click here for more information and to donate to "Cut for a Cure."